Sometimes it hits me just how special this house is flaws and all. Built in 1928 true to the craftsman/bungalow style. My favorite part of this house besides the outside is this fireplace mantle. I love that over all the years and all of the owners this home has seen this fireplace brick has not been touched and is 100% original. There have been so many fads and decor trends over the years to prompt people to paint this pink brick but I'm so glad no one ever did. I myself have been tempted to paint the brick to a more trendy white, but just couldn't shake the thought of how wrong that would be. Now I love it and feel it is my duty to take care of it so it will be around for another 90 years. This authentic bungalow style mantle with its matching and original bookcases is the pride of our home and deserves to be decorated accordingly. It can be challenging to decorate with the past and the present in mind. That's why I always try to mix a little old with a little new. 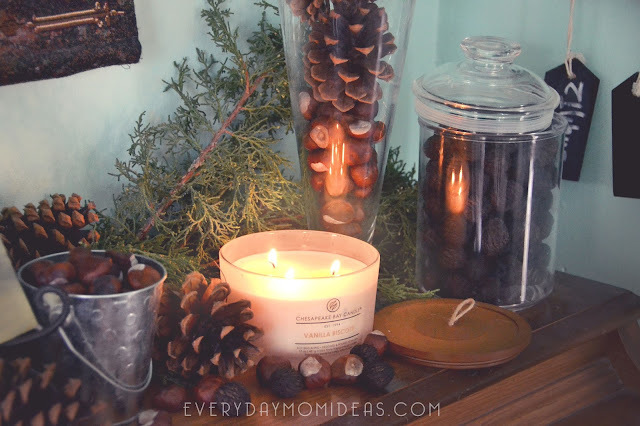 For this years fall look I was inspired by The Heritage Collection by Chesapeake Bay Candle and by all the nature all over my yard. 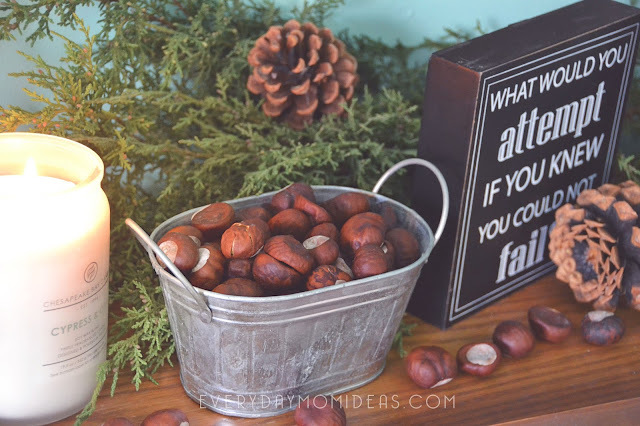 It all began with these chestnuts that dropped from our tree and was now in abundance all over our yard. Sounds like a nice problem to have but the sad thing about these chestnuts are they are NOT the edible kind. These pretty little deceptive beauties are completely useless… or are they. That’s when it dawned on me… I should decorate with them. 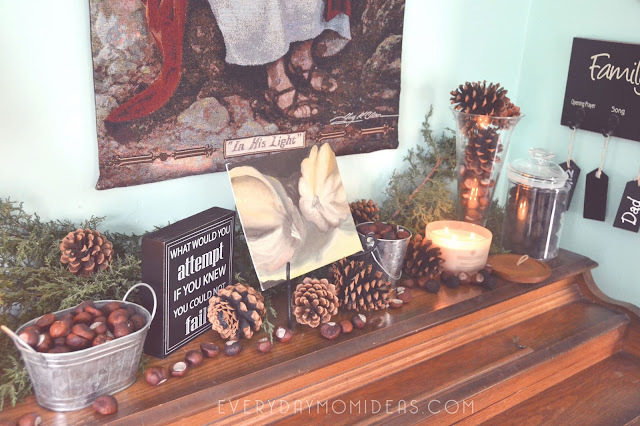 This little experiment surpassed all my expectations and I am in love with the natural beauty these different elements add to our festive vibe in our home. Decorating with nature is a tried a true decor practice that has stood the test of time. 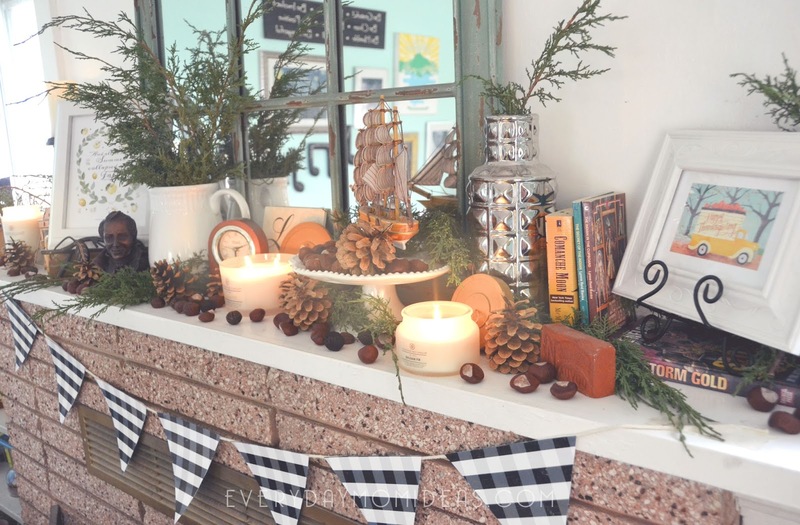 That's what makes the addition of the Chesapeake Bay Candle Heritage Collection so perfect in this space. The Heritage Collection candles were inspired by the natural rustic charms of the Chesapeake Bay with its beautiful frosted glass and minimal natural packaging design. It adds just the right touch of modern, elegance and nature. When decorating I try to use and reinvent some of the treasures I already have and use them in different creative ways, and then I like to add a few natural element to the look. To finish it all up I make sure to always add my “one something special”. These stunning USA made scented candles are my something special this season. 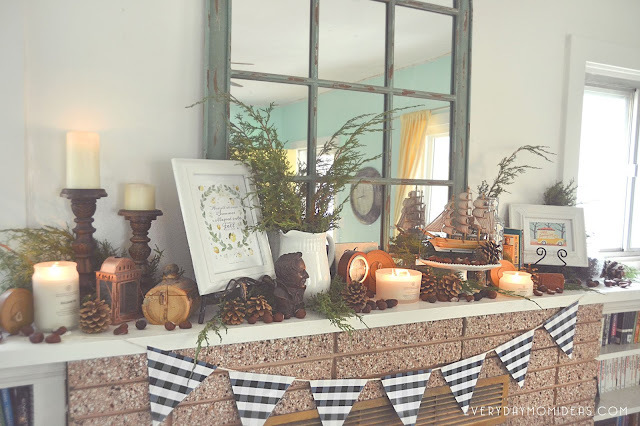 They have been strategically placed throughout the main living room and attached dining room to add that festive glow and invigorating scents of fall and winter. It might be getting frostier outside but it's definitely cozying up in here. 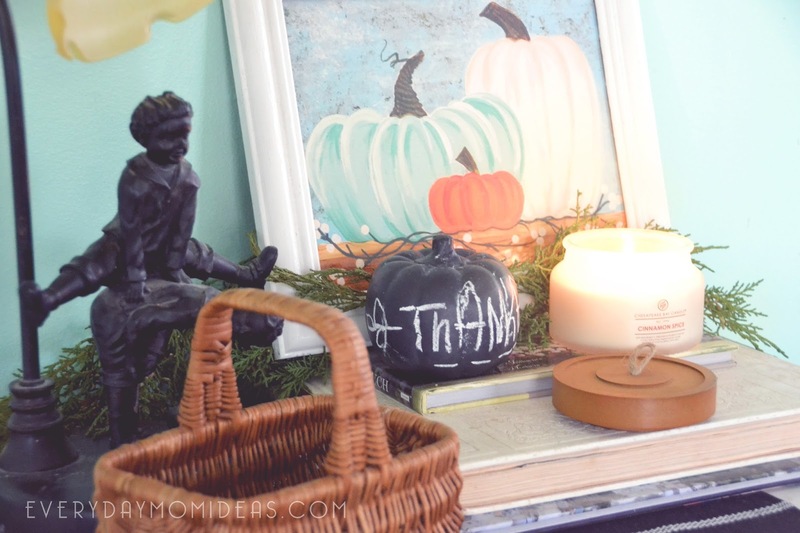 The Pumpkin Latte coffee table jar candle is the centerpiece for my bungalow fireplace mantle decor. I love this large triple wick candle because it lets off a bright glow and enough fragrance to fill the main floor of the house with its aroma of pumpkins, pralines, and pecans. Oh my! 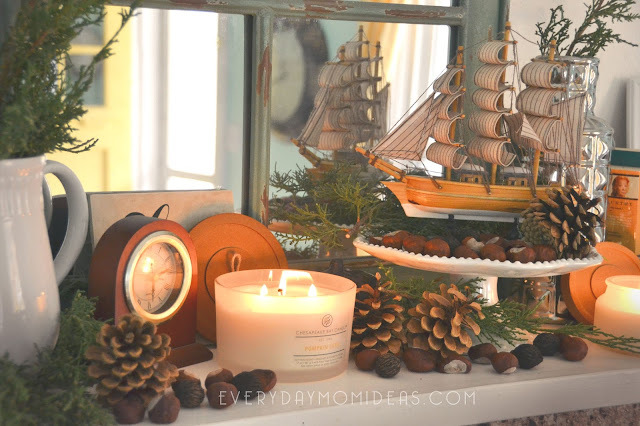 I've accessorized the Pumpkin Latte candle with some pinecones, chestnuts, black walnuts and of course a figurine of the Mayflower. 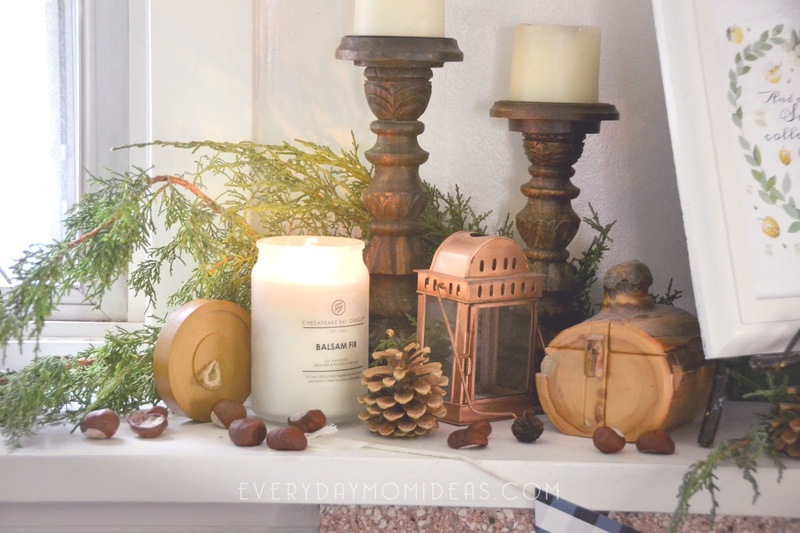 To the left, you will find the Balsam Fir large jar candle that couldn't be more fitting for the upcoming Christmas season with its evergreen pine, fresh balsam, and spiced pomander scents. 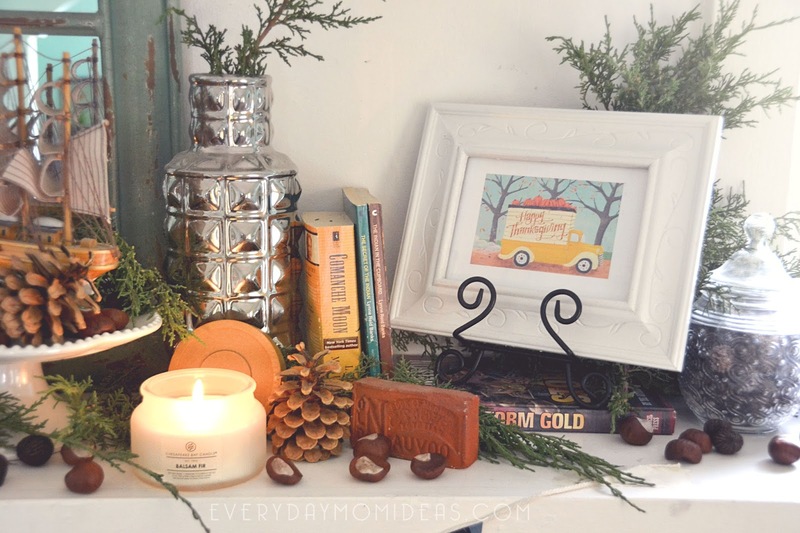 And on the right, I have the small jar of the Balsam Fir candle perfect for smaller spaces. The larger soy blend candles last for 80 hours, the coffee table triple wick candles last for 35 and the smaller candles last for an impressive 20 hours. 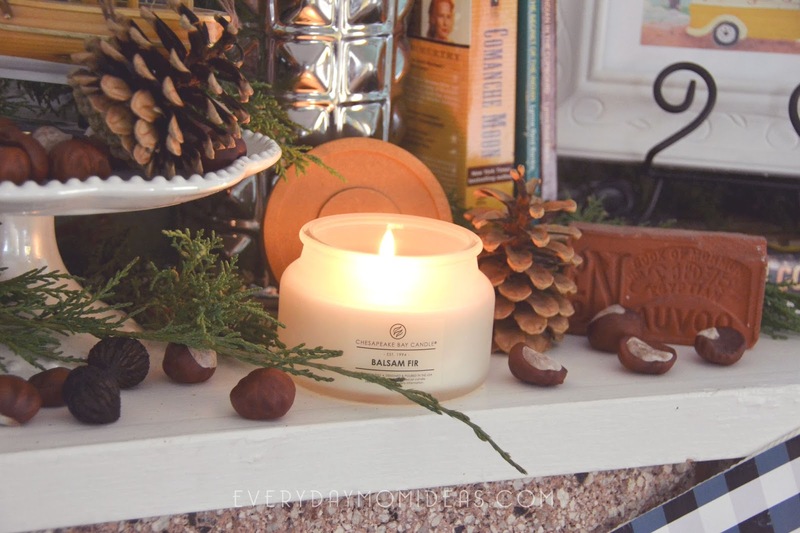 The Cinnamon Spice small jar candle is perched on my white chest of drawers in the living room and is always a great transitional scent that goes from Thanksgiving to Christmas with its rich cinnamon scent mixed with a hint of eucalyptus, nutmeg, bay leaves, and clove. 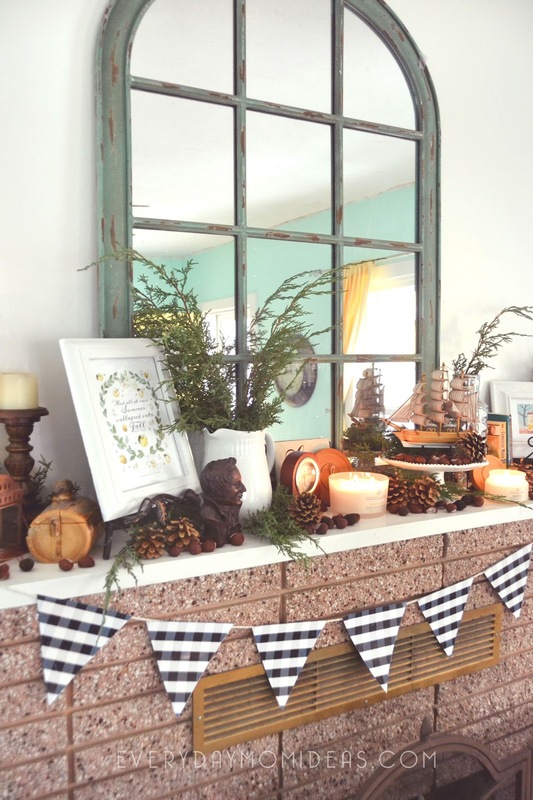 Decorating for holidays doesn't have to be hard if you just learn a few simple tricks. 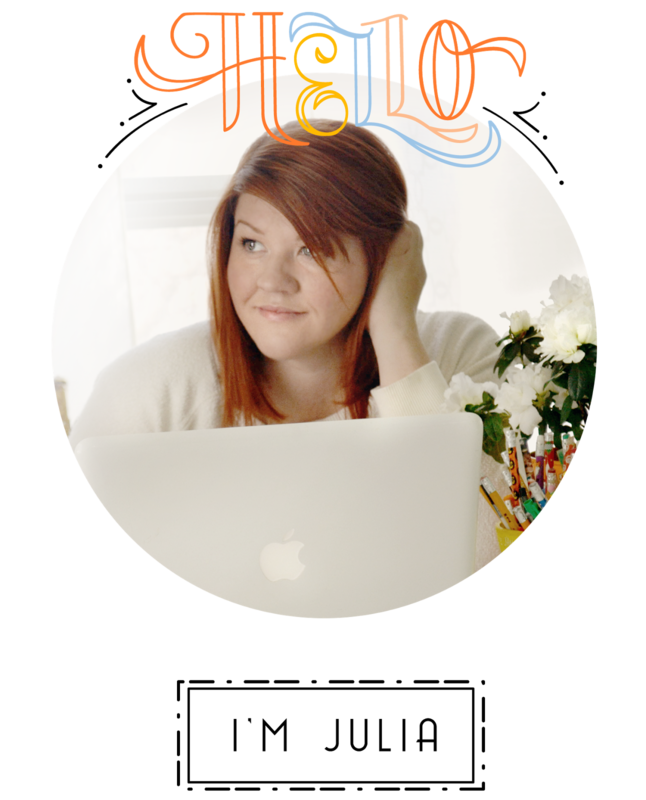 Sometimes the simplest design or idea can have the biggest impact. Like a simple candle design or simply using the bounty of nature. 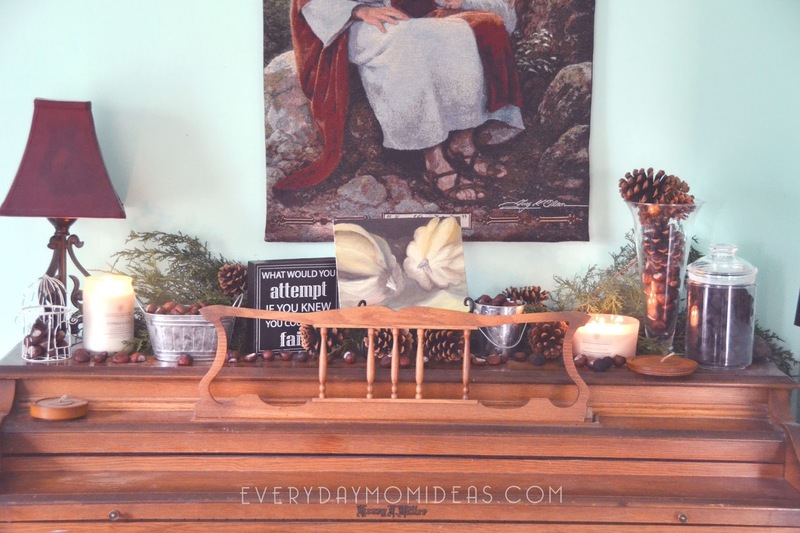 TIP: Here is a little coffee table decor tip for you busy moms with little toddlers: I keep my entire coffee table decor nestled in a large tray. That way it is quick to move out of the way from little fingers. 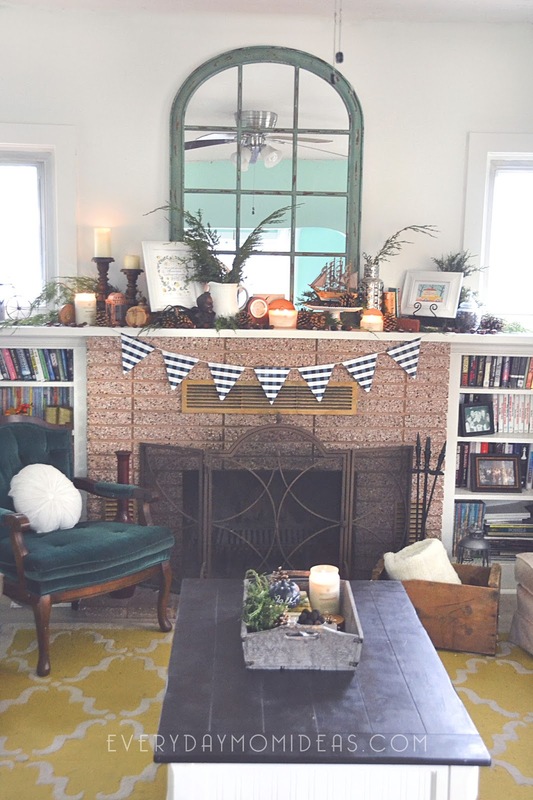 We also use our coffee table regularly for game night and it's quick to move out of the way and quick to move back without ruining the setup and design of the decor. 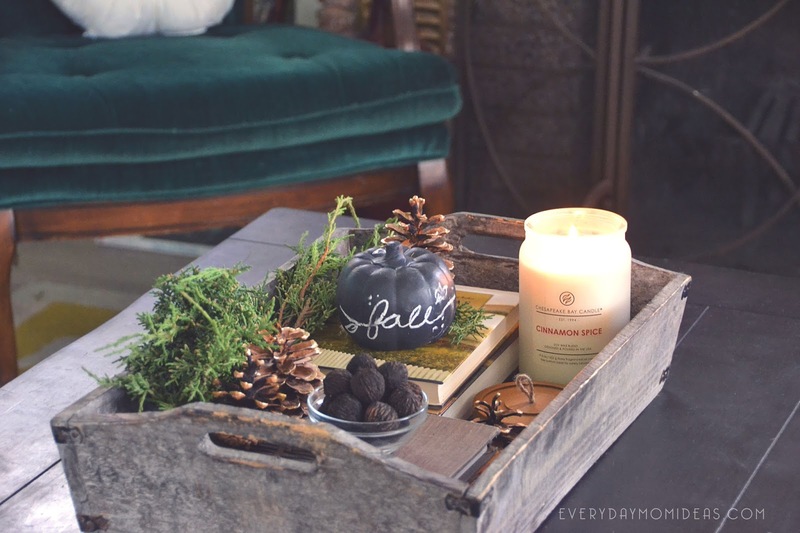 Right now I've decked my coffee table tray out with gold-tipped pine cones, rare black walnuts, cypress foliage, fall themed books and the Cinnamon Spice large jar candle from the Heritage Collection. I love that this whole look can easily be transitioned over from Thanksgiving decor to Christmas decor. Remove the Mayflower and add a nativity and there you go. The Chesapeake Bay Candles really go with everything. I use them in just about every room in my old historic home and they only add to the warmth and decor. You will be amazed by the thoughtfulness put into every scent combination and craftsmanship and quality of the candle itself.